It has been 26 years since The Gemnist won the NCHA Futurity. At 29, he is the oldest living Futurity champion. Yet, the venerable gelding’s teeth are the only giveaway to his age. Sired by Doc Bar Gem, a full brother to well known sires Boon Bar, Doc’s Remedy, Cal Bar and Nu Bar, as well as to Doc’s Haida, dam of Haidas Little Pep, one of cutting’s all-time leading sires, The Gemnist was bred by Jim and Mary Jo Milner and trained and shown by Kathy Daughn. Following his limited age event career, where he earned nearly $350,000, The Gemnist was shown by Radomske at weekend events. “If I’d known then what I know today, no telling how long he would have lasted,” said Radomske, who was 42 years old the first time he rode a horse and had became interested in cutting the same year that he bought the Gemnist. “He was so solid, but at that time I practiced him three days a week and showed him three times a day, every Saturday and Sunday, for about two or three years. I didn’t realize it at the time, but I basically burned him out by practicing and showing him too often. 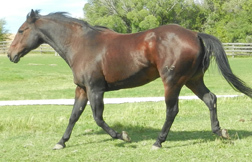 For a number of years, The Gemnist served as a ranch horse on Radomske’s Venture Farms, then eventually took over his current position as manager of the farm’s broodmares, which include Opus Cat, who placed 6th in the NCHA Open Futurity, with $60,000 and Miss Smoke Travels, PCCHA Open Futurity reserve champion, with $80,000.